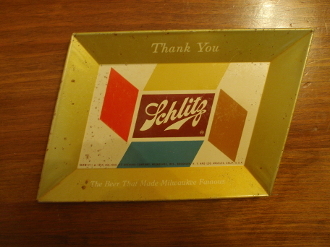 Schlitz Beer tip tray that measures 7 1/2" x 4 1/2". "The best that made Milwaukee Famous". Dated 1955 & maker marked Schlitz Brewing Company, Milwaukee, Wis., Brooklyn, NY & Los Angeles, Calf. U.S.A. Nice tray with some surface wear. Very nice tip tray.